Here is my post the Déjà vu blogfest for 2015. I am picking something, not from early this year, but this summer. I am choosing Class Struggles & PWWO: The Blood Witch. I liked this post because it was one of the first of the Class Struggles post I made which has become one of my favorite features of late and I have always loved Plays Well With Others. Hope you all enjoy this repeat! Yesterday I reviewed the newest book from +Johua De Santo New Class Options. One of the classes in the book, the Blood Witch, struck me as familiar. I remembered I had seen an earlier version of it in Dungeon Crawl #3. Today I want to go into a bit more detail about this class. The class is an old archetype of a blood mage or a blood witch going all the way back to ... well forever really. Right up into the Enlightenment people believed that there were magical properties to blood. This is why "witches" signed contracts with the devil in their own blood. There have been other blood witches in the past. Notablly the Blood Witch Prestige class from Relics & Rituals and from Mongoose's Ultimate Prestige Classes vol. 1. Both books have the same class. Blood Witches used whatever spells they gained from their previous spell casting class. The Blood Witch in New Class Options is a bit similar. It uses magic-user spells. This is perfectly fine really, but some new spells would add some more flavor. I was looking forward to this class the most and I still think it works well, but I have some issues with it. Let's start at the top. The Blood Witch uses Constitution as her main stat. Very, very appropriate. She needs a Con of 13 or higher. Again appropriate. Constitution scores above 16 also grant an additional +1 to hit points. Nice. She is going to need that. Then we get to the next bit, quoting from the text. Ok. A neat bit a of flavor. But 60% every day? That seems a bit high and then she can cast as a level higher? Well sometimes that helps. But who makes this roll the GM or the player? Personally I would have it at 25% myself. Or tie it to the phases of the moon or time of day. THEN also a 25% where she can cast as a level lower. I GET what is trying to be done here, but I would need to play it over a few sessions to see. Here is the part I am not crazy about. The Blood Witch needs to roll against her Constitution in order to cast spells. So the high her Con score, the less of chance she has of success. Again, from the text. Ok. So mechanically I get what Johua is trying to do here. I also spoke with him. It is to limit the amount of spells a witch can use. Since a witch can use theoretically ANY spell once she gets to the right level. In some ways her spell casting is more similar to the witch in +Jonathan Becker's The Complete B/X Adventurer than it is to anything else. So a witch with a 16 Constitution could only cast spells up to 4th level, unless of course a 20 allways means a success. I think what might work better here is limit the number of spells known. The blood witch might be able to cast this she completely out of blood (not advised) but maybe she only knows X per level. Like the 3rd Edition Sorcerer. This would impose a limiting factor. Then give her a bonus to her roll equal to her level. So our Blood Witch with 16 Con and 5th level would need a 15 or better to cast a 4th level spell (16 + 4 -5 =15). That seems to work well. The experience levels for Blood Witch seem a bit high, granted this class has the potential for a lot of power. I'd still like to play one sometime just to be sure. Somethings you see in the the myths and stories of blood magic is sacrifice (which is covered here as personal sacrifice) and proxies. So could this blood witch use an animal sacrifice for some spells? I think where appropriate yes. Proxies could be things like the animal but also proxies for blood itself, like purified water (possibly for healing spells if you use one of the witch spell lists) or even wine (blood of the vine). Personally I would allow such proxies for some of the more benign or even mundane spells. The Blood Witch is any interesting type of character and something that could add a air of different to a game. A Blood Witch doesn't have to be an evil character, but it not likely she is going to be trusted by a party and certainly looked down on by other casters especially proper wizards. The best thing about the Blood Witch is that fits a great niche in any gaming group or campaign. It also works with a number of great OSR books. Obviously the blood witch will work mechanically with 99% of all the OSR and old-school books out there, the real question is will it work thematically. For example, the blood witch would work fantastic with Lamentations of the Flame Princess, but thematically it might be a bit redundant since all magic-users are assumed to have some sort of dark(-ish) pact. I already mentioned The Complete B/X Adventurer. The witch class as presented in that book works as a great base for the Blood Witch. Combine the two classes into one works rather nicely. The B/X Witch has spells up to 10th level which is nice, but the New Class Options Witch only goes to 7. I mentioned that the Blood Witch is really missing some really cool spells. The Vivimancer from +Gavin Norman's Theorems & Thaumaturgy and Complete Vivimancer offer some really nice choices. I created a few for both my witch and the vivimancer here. In particular I would suggest Blood Augury, Feel My Pain, Share My Pain, Stay Death's Hand, and of course Hell Hath No Fury because every witch needs that spell. A while back I made some suggestions about witch spells for the vivimancer and vivimancer spells for the with. The nice thing is the blood witch is perfect cross section of both classes and can use all these spells. The blood witch also works great with +Jeff Talanian's Astonishing Swordsmen & Sorcerers of Hyperborea. The style and type of magic used by the blood witch would be very much in tune with AS&SH. Sacrificing blood for magical effects...yeah very much in tune. There are also plenty of great witch spells in that book as well. I would be remiss if I didn't mention my own book, The Witch: A sourcebook for Basic Edition fantasy games. I am going to have to play a Blood Witch sometime, but I also think I want to try her out as Blood Witch "Tradition" using my own rules and see how well they work together. 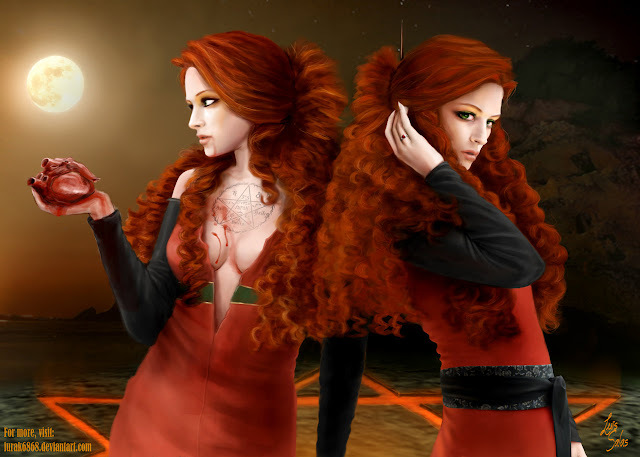 Maybe twins...same level but one is a DeSanto Blood Witch while the other is a Brannan one. Interesting idea really. If you are in the mind to some conversions, there is a great set of blood magic rules and spells in +Owen Stephens' magnum opus Deep Magic for Pathfinder. The blood magic system in that book could work nicely for a blood witch as well as a blood mage. Again this passes the most basic test for a class for me. Can I think of a character for it and would I play it. Kimbra and Kelleigh are twin sisters with magic deep in their blood. They often have said to each other that it is because they have shared blood that their ties to each other and magic was so strong. Though in their darker moments they felt their connection to magic and to blood came from the moment they were born. Kelleigh was first. Right after her birth their mother died. Kimbra was born when the midwife noticed that there was still something in the lifeless body. To this day Kelleigh has had a great connection to blood and Kimbra to death. Kelleigh acts as the older sister. The sisters only trust each other. These are two characters I have had for a while now. They began as modern characters for a WitchCraft RPG game and then morphed in a life-span development project I never quite finished. Yes, the names are based on Kim and Kelley Deal. But also an homage to Kim Harrison and Kelley Armstrong, two of my favorite authors in the modern supernatural genre. Kimbra can cast the follow spell levels. Will choose spells based on the official list. I like these two. I like that they are twins and really mostly the same but have classes that are different takes on the same thing. I would not make these two part of the Witches' Nest. I feel their back story is too tragic and their personalities are not one to take advantage of others. Though they will have a place in my new WIP "West Haven", mentioned briefly here. When I try this class out more I will let you all know. ADDENDUM. I have tried it out more and really enjoy it. I am pleased with how this witch works and I still really love Kimbra and Kelleigh. I really want to do more with these characters. Intriguing characters. Thanks for sharing.